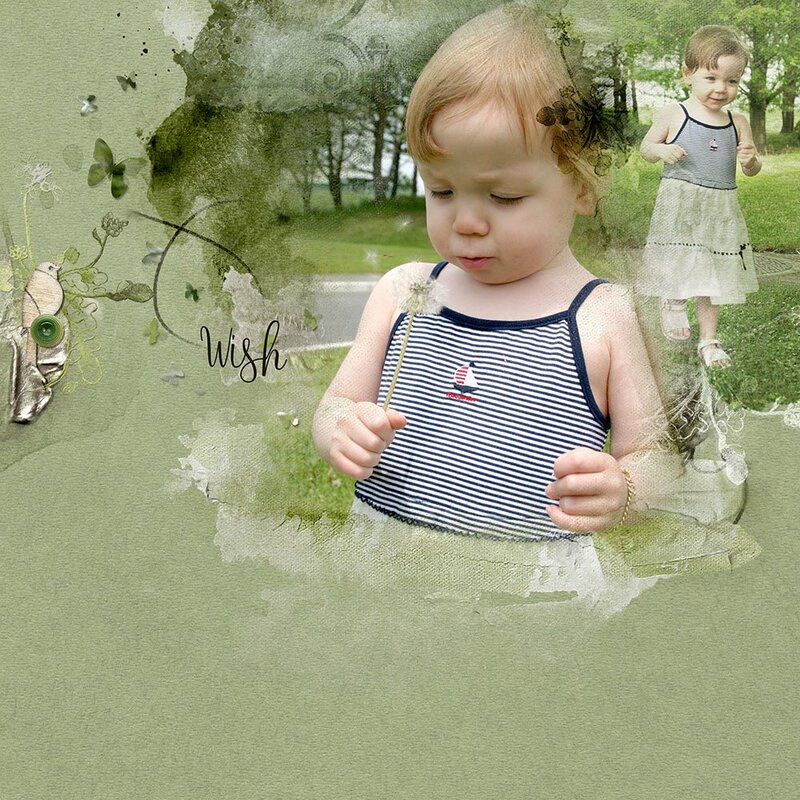 Advanced Brushes in Photoshop Elements add the AWESOME to digital artistry and scrapbooking. 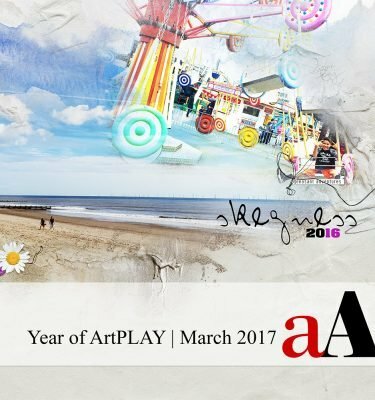 YOU WILL LEARN BASIC TO ADVANCED BRUSH TECHNIQUES IN ADOBE PHOTOSHOP ELEMENTS TO ELEVATE YOUR ARTISTRY SKILLS AND ENHANCE YOUR LAYOUTS. 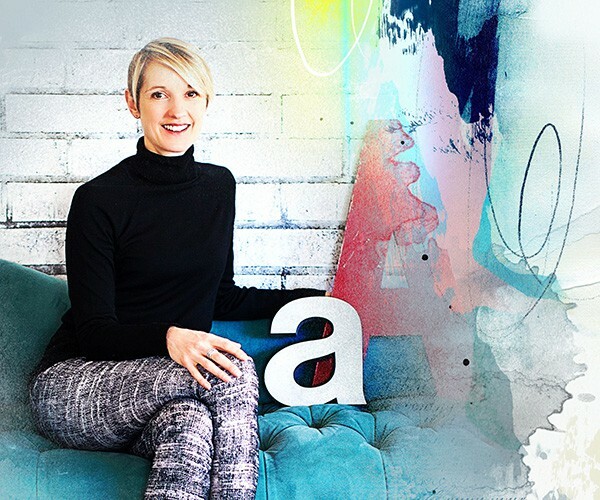 Step-by-step guidance to instilling confidence, and adding incrementally and logically to build a strong foundation, is how the work gets done at Anna Aspnes Designs. Then aAdvanced Brushes in Photoshop Elements is definitely for YOU. 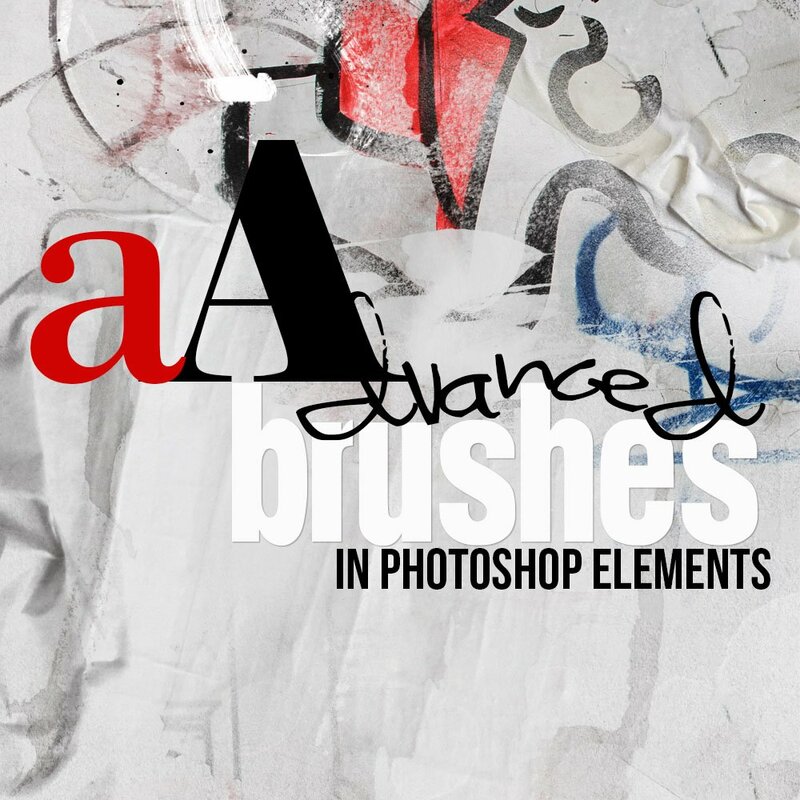 Advanced Brushes in Photoshop Elements is for photo enthusiasts, scrapbookers and digital artists looking to boost skill and creative flair in the realm of Brushes. The course is divided into 3 self-paced sessions, each divided into multiple videos for approx. 5-1/2 hours of artsy digital design education. You will learn the basics of using brushes, as well as key information you need to know about brushes, before taking a detailed look at how to use Brushes via the Brush options. 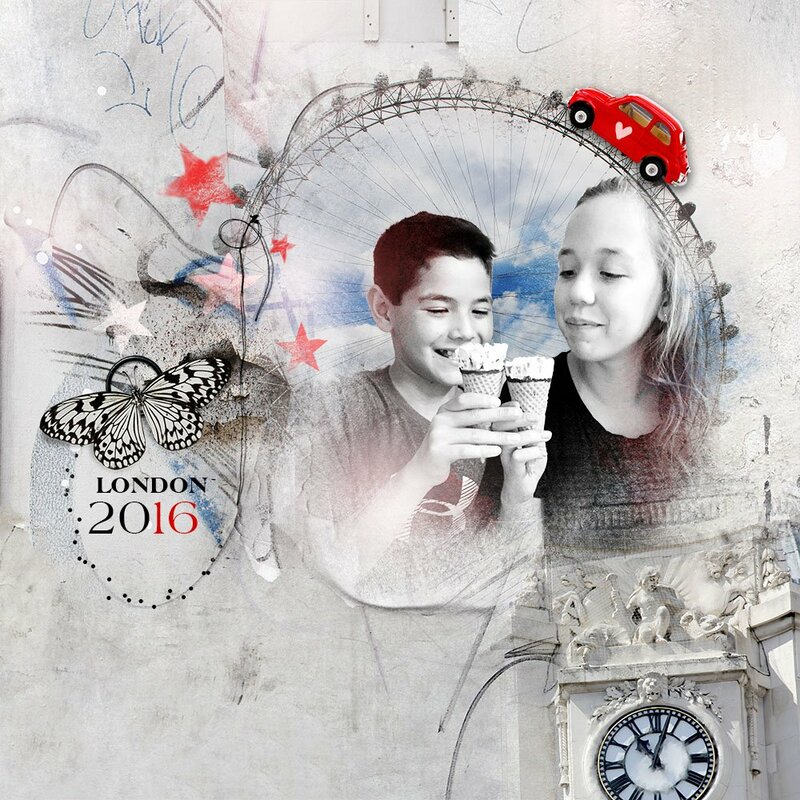 A ‘Big Picture View’ of using brushes in Photoshop Elements will be provided, to include the different ways you can use them to impact your artistry, and how they transcend to use to other tools in Photoshop Elements. How to make key Preference changes beneficial to using brushes and customize your viewing options. The tools in the Brushes Options and how to use them. Useful shortcuts and keystrokes needed to speed up your artistry process. Take advantage of Pen Pressure if you use a Pen/Tablet. Saving Brushes for future use. Best practices for creating your own brushes in Photoshop Elements. Using brushes with other Photoshop Elements tools, such as the Eraser, Clone and Smudge tools. 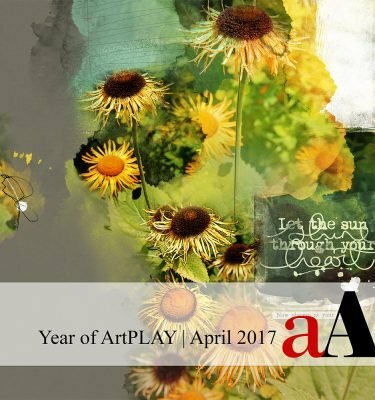 *Please note that I will be sharing some of the techniques I use to create brushes, but I will not be showing you exactly how I create the brushes at Anna Aspnes Designs. 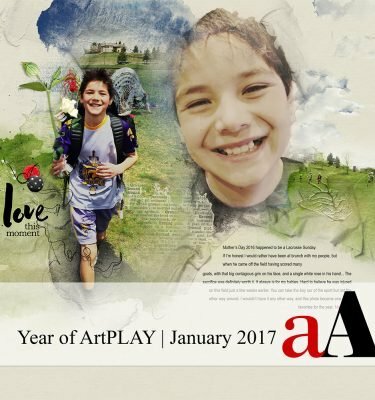 In sessions 2 and 3, you will learn 14 different ways to use brushes in 2 different layouts (DigitalART supplies and layered .psd file included). Breaking the content into 2 sessions will ensure assimilation of information, avoid brain-overload and provide opportunity for repetition which always enhances the learning experience. Session 2 includes: Part 1 (20.15 mins), Part 2 (23.48 mins), Part 3 (20.56 mins), Part 4 (16.32 mins). Session 3 includes: Part 1 (19.29 mins), Part 2 (16.44 mins), Part 3 (21.10 mins), Part 4 (21.48 mins), Part5 (6.45 mins). 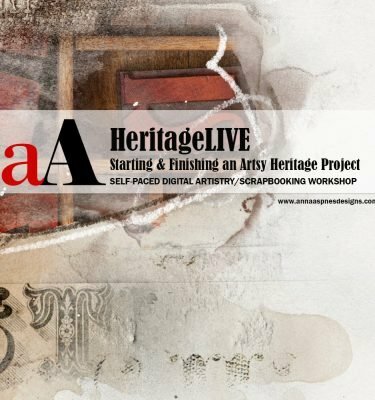 This workshop is jam-packed full of content and is provide a balance of theory and technique in a project based approach. If you’ve attended any of my previous classes, you’ll know that I over-deliver am am committed to the teaching process and making the magic happen for YOU. 3 Self-paced video sessions delivering approx. 5 1/2 hours of step-by-step video instruction. 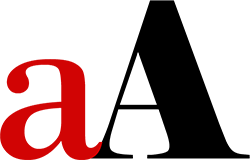 In depth written course content in .pdf format accompanying each session. 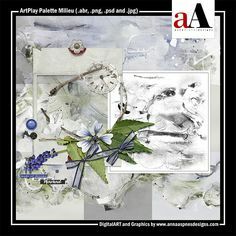 All aA DigitalART supplies used in aAdvanced Brushes in Photoshop Elements. Both layered .psd files created in sessions 2 and 3. 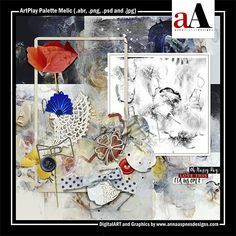 Advanced Brushes in Photoshop Elements workshop is conducted in Adobe Photoshop Elements version 15 but you can follow along in any recent version of the Software. I recommend Photoshop Elements 9 or above. I have been a PSE digital scrapper for 8 years and I was always afraid to use brushes other than the eraser brush. I didn’t understand how to use them or load them so they remained in my presets. Then, this year, I took some of Anna Aspnes’ classes which explained using brushes and how to keep them loaded. I felt so good about myself that I enrolled in her Advanced Brushes course. Now I’m almost “brush crazy”!! I don’t hesitate to use brushes to mask or create splotches of paint or to color with in order to change b/g colors. I even learned that the eraser can be used with any loaded brush. I’m so grateful that Anna presented this class for PSE users. I was a complete brush-a-phobe when I enrolled in this class, meaning that brushes scared me to the point that I used the png files rather than the actual brushes themselves, and when I did use my png brush files, I did so in the most basic fashion. No more. Thanks to this class, my inner brush-ista has been released. These days I find myself reaching for brushes (the real ones, not the pngs) in every composition I create and often muttering to myself “who knew, who knew?” I particularly appreciate that this class delivered the basics I needed to establish a firm foundation and then took off from there into the world of creative brushology. That’s why, in addition to learning how to use brushes for maximum creative impact, this former brush-a-phobe can now clone things in and out of designs with impunity, wield the eraser and other tools with confidence, and even make custom (color) brushes. The information sticks because you learn it in the hands-on context of page layouts; because Anna is demonstrating every technique, you see what can go wrong–and how to troubleshoot, cycle through options, and get out of the tight spots that we all find ourselves in. So valuable. If I need a refresher on the finer points (and more complex techniques), as I trundle along in my creative journey, I simply have to review the pertinent lessons. It’s all in there. As always in her classes, Anna has delivered more than she promised in this one. Highly recommended. This video series is fabulous! Anna starts by teaching the most basic things about Photoshop brushes. Like how to adjust the brush curser for maximum visibility, how to locate the brush tool and change from one brush to about a million others. Then she moves on to teach about adding color, fade techniques, and much, much more. After that she opens up another whole world of possibilities: creating your own brushes from your own photos! The videos are so packed with techniques and info, that after 5 months, I still play them to refresh my memory and to inspire new ways to make my layouts more interesting and beautiful. So amazingly helpful!!! This was my first Artsy course with Anna in March, 2018. I am actually a hybrid scrapper but used Elements to clean up pictures and add a few digital elements. After a while I realized there was a whole digital scrapbook world out in the ethernet and begin purchasing a few things and reading tutorials and blogs. I used brushes mainly to create backgrounds and because I used them infrequently it was always like starting over to figure out the presets and get them loaded. After viewing Anna’s products and Artsy work I knew I wanted to do more in the digital world. This course is expansive – really expansive. I had no idea you could do so many things with digital brushes. This course covers it all. Anna’s presentations are really organized with the videos and art supplies titled the same and she provides written documentation as well which is good for me to make notes. I would say Anna’s comprehensive classes are the best! So grateful Suzie you had an amazing experience.